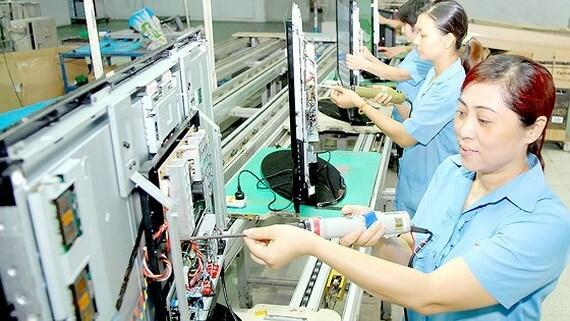 Vietnam’s electronics exports were estimated to nearly reach US$100 billion in 2018, making the country become one of 20 largest electronics exporters worldwide; however, more than 95 percent of export value and 90 percent of supporting industry products in this sector belonged to FDI enterprises. Workers assemble televisions at a Vietnamese firm. Analysis by the General Statistics Office of Vietnam showed that of the total export value of electronics, appliances, machineries and accessories sectors, cell phones and accessories accounted for the largest proportion with $50 billion. Electronics, computers and components fetched US$29.4 billion. Machineries, equipment and spare parts earned $16.5 billion. These are the products of Vietnam that have always been key export products in the past five years which keep posting exports of billions US dollar. However, proportion of key export products was still in the hand of FDI companies. So, where are Vietnamese companies in global supply chain? This is main concern of many experts. Mr Pham Hoai Nam, vice president of Ho Chi Minh City Association of Mechanical – Electrical Enterprises, said that unfair competitive environment was the main reason that made local supporting industries companies unable to develop or expand business, especially the controversial import tariff policy. Local companies had to suffer import taxes when importing materials for production whereas FDI ones were immune from taxation when importing materials and machineries into the country. In addition, FDI companies also received preferential policy on duties and land rental. Meanwhile, local companies had to pay all those costs by themselves without any preference. This has helped FDI companies to have a lower cost price that could not be competed by local ones. It is undeniable that the Government has offered attractive policies to draw investment from foreign investors, especially end-product manufacturers, during the past years. However, authorities have not categorized which manufacturer in the supply chain receiving preferential policy, which not. Therefore, several FDI companies have taken advantage of this loophole to get preferential policy for their entire supply chain, consisting of supporting industries manufacturers and end-product manufacturers. As a result, local companies could not participate in the supply chain of end-product manufacturers. Ho Chi Minh City Center for Supporting Industries Development suggested that end-product manufacturers should be separated from supporting industries manufacturers in the supply chain of end product manufacturers. Preferential policy should be applied for end-product manufacturers only. Supporting industries manufacturers will not receive preferential investment policy and have to pay taxes and fees like local ones. This will ensure a fair competitive environment between local and foreign manufacturers in the supply chain. Mr Pham Van Tam, CEO of Asanzo, said that local manufacturers should proactively assess their production capacity in order to choose suitable supply segment. Moreover, they should have a long-term investment strategy; improve production capacity as well as management skills. At the present, some manufacturers have invested in modern machinery with advanced technology to produce supporting industries products which are able to compete with imported ones and meet requirements of end-product manufacturers. This will be the base for local manufacturers to approach and enter global supply chain. According to Mr Pham Van Tam, local authorities have had policies to support enterprises in this sector though implement is still limited. Many companies have struggled to search for land and financial aid. Mr Nguyen Hoa Cuong, deputy head of Enterprise Development Agency under the Ministry of Planning and Investment, said that raising the ratio of home supporting industries products helps to increase export turnover and narrow the exports gap between local and FDI enterprises. On the other hand, this solution helps to reduce risk for local companies. Therefore, in the near future, relevant ministries have to focus on supporting small and medium enterprises to improve their competitiveness and build trade mark. Activities to connect Vietnamese companies to multinational companies in Vietnam will be promoted to help them to get more information, gradually standardize production process and shorten the time to meet requirements to join the global supply chain. If the solutions are carried out synchronically, it will be an opportunity for 98 percent of 700,000 small and medium enterprises in Vietnam to take part in global supporting industries supply chain of electronics, machineries and accessories sectors. Up to now, most of components and spare parts for production of electronics, computers, equipment and accessories of FDI end-product manufacturers were imported. Home products only accounted for more than 10 percent. Local manufacturers have just provided basic and simple products with low value like mechanic components, plastic, rubber, packing, manuals and molds.